Below are figures from Chapter 1 of the Foresight Africa 2018 report, which explores six overarching themes that provide opportunities for Africa to overcome its obstacles and spur inclusive growth. Read the full chapter on African leadership here. On Thursday January 11, the Africa Growth Initiative at Brookings released its annual Foresight Africa report, highlighting six key priorities for the continent in the year 2018. The first chapter of the report, Unleashing Africa’s inner strengths: Institutions, policies and champions, discusses strategies for tackling the continent’s challenges more effectively. This post highlights African countries’ visa openness vis-à-vis the citizens of fellow African nations as indicated by countries’ visa requirement legislation. In recent years, African countries have loosened visa restrictions on their neighbors in order to facilitate the free movement of people and goods, thus, regional integration has become a priority. The continent is seeing a shift towards more free movement of people: In 2016, Africans did not need visas to travel to 22 percent of other African countries, compared to 20 percent in 2015. The small increase may indicate that the way forward will yield more visa openness, with African countries being more open to host African citizens from other countries. 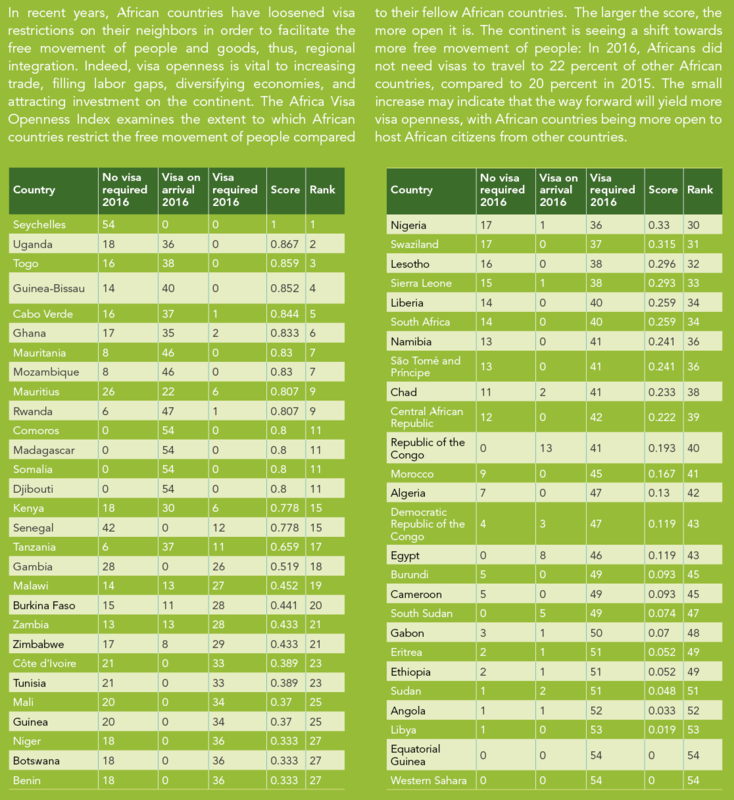 In early 2017, the African Development Bank, in collaboration with the African Union and the World Economic Forum’s Global Agenda Council on Africa published the Africa Visa Openness Index Report, which ranks African countries based on their visa requirements regarding their fellow African countries. The score looks at whether a country requires visas from African citizens, may it be on arrival or otherwise. The larger the score, the more visa open the country is. There are three different classifications concerning visa requirement. Visa required means a visa has to be obtained before departure. Visa on arrival means a visa has to be obtained upon arrival in the country. This includes filling out any visa application forms, paying the visa fee if applicable, and receiving a visa in a travel document. No visa required means that there is no visa needed either before departure or on arrival, with no entry authorization required to enter freely into the country. Entry procedures—such as filling out entry forms and receiving an entry stamp—are still mandatory. The map (Figure 1) shows that East African countries are relatively more visa open than their African peers. Uganda grants visa on arrival to most African citizens and the remaining ones do not require a visa to enter the country (Table 1). Regional economic community (REC) scores are averages of country scores and reflect the individual openness of countries in the REC toward their fellow African countries. 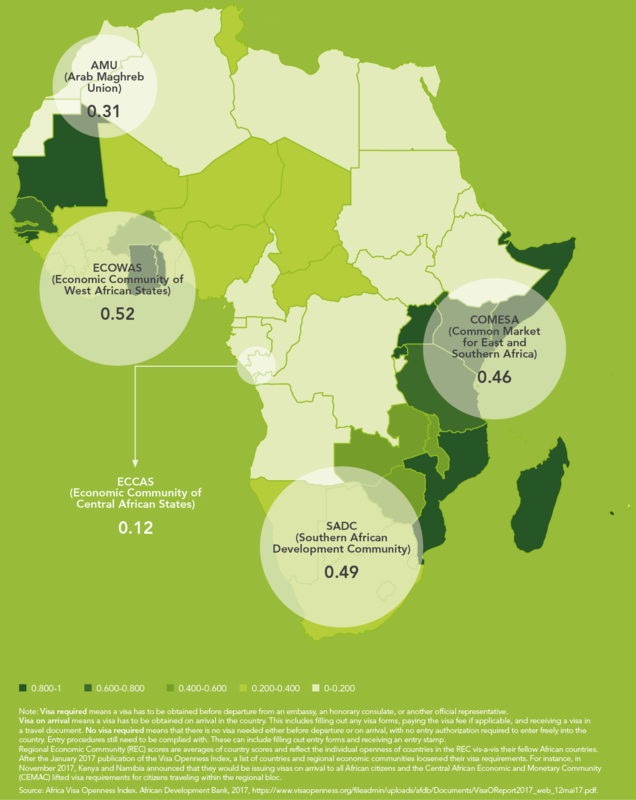 As a group, ECOWAS is more visa open than its fellow regional economic communities. After the January 2017 publication of the Visa Openness Index, a list of countries and regional economic communities loosened their visa requirements. For instance, in November 2017, Kenya and Namibia announced that they would be issuing visas on arrival to all African citizens and the Central African Economic and Monetary Community (CEMAC) lifted visa requirements for citizens traveling within the regional bloc.